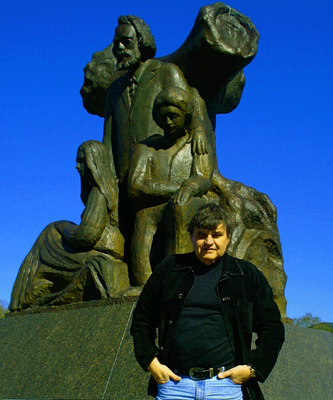 George Rodrigue holds a deep appreciation for classicism in the visual arts. 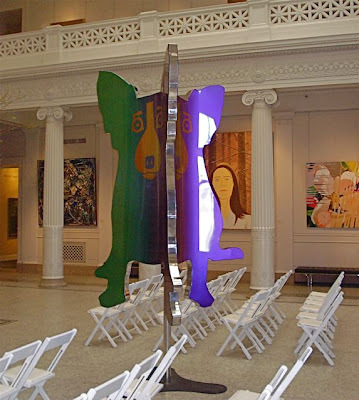 In a way, this embrace of time-honored techniques and subjects translates to a parallel within his own career, as even today he talks about his bronzes of the mid-1970s with reverence, recalling the process as though he worked alongside Donatello himself, paying tribute to the statues of antiquity. Rather than a figure from the Bible or the Ancient World, however, George embraced from the beginning a more familiar subject, one that is classical within his own Cajun culture. As described in the post “How Baby George Became An Artist,” it was while bedridden with polio at age nine that George chose his life’s path. His mother brought him paint-by-number sets and modeling clay, and for the first time he formed familiar objects and scenes with only his hands and imagination. 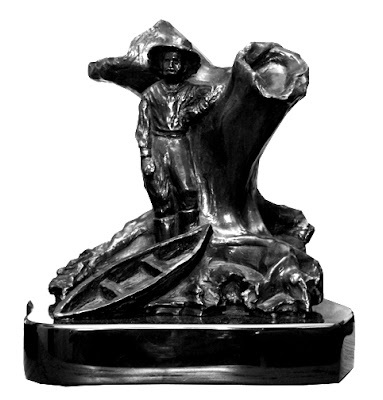 For George, this childhood wonder at creating something from nothing continues today, and it certainly inspired a series of bronze sculptures during the height of his Cajun series. 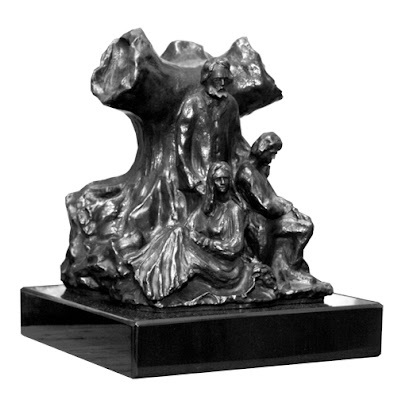 To create his bronzes, George first sculpts his design in potter’s clay, as in the unfinished relief piece above. He prefers this method because potter’s clay begins soft, growing harder while exposed to the air. He achieves the smooth areas by modeling the soft clay with his fingers and the rough areas by chiseling the hard clay with metal tools. It is a laborious, exhausting process, requiring 12-15 hours of commitment at one sitting, and resulting in a very hard piece of clay. 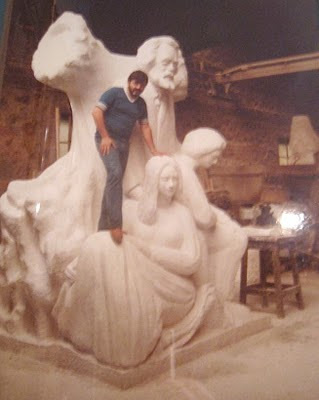 He brings the finished clay sculpture to a foundry, early on using a friend’s backyard furnace in Ponchatoula, Louisiana. 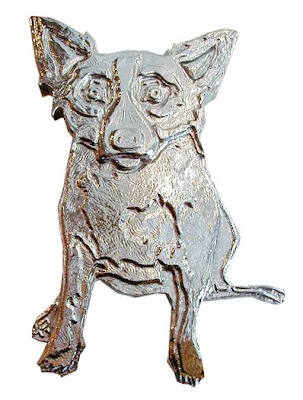 In the late 1970s he used a makeshift artist’s destination in the Houston warehouse of a retired fence manufacturer, and by the 1980s he used the more professional site at Shidoni Foundry in Tesuque, New Mexico (near Santa Fe, which he uses today). Most exciting, during the mid-1980s he spent extensive time at a foundry in Pietrasanta, Italy, a medieval town famous among artists for its foundries and marble since the Italian Renaissance. The foundry's artisans prepare his sculpture with liquid rubber, applying the gooey substance up to three inches thick. Over the hardened rubber they add a five-to-eight inch thickness of plaster of paris, resulting in a large ball with the clay buried inside. At this point they cut the entire piece in half, chiseling the clay out of the rubber, basically destroying the original sculpture in the process. 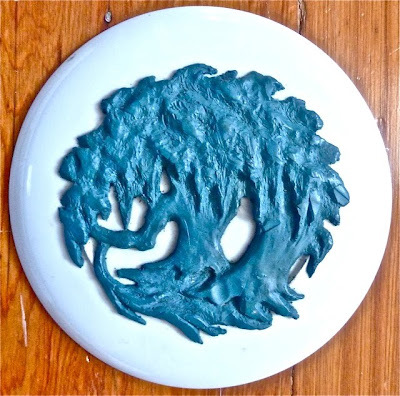 The resulting rubber mold is a negative of the original design. The artisans then pour hot wax into the mold, sloshing it around to fill the cavity. Once the wax dries and hardens, they cut away the rubber mold, exposing an exact copy (in wax) of George's original clay sculpture, a process required for every bronze piece produced, whether part of an edition or not. From the wax copy, the foundry's artisans paint a thin porcelain clay over the sculpture, up to five inches thick, leaving the bottom exposed. They fire the clay in the oven, where the wax melts and burns out, leaving a porcelain mold holding the negative sculpture. 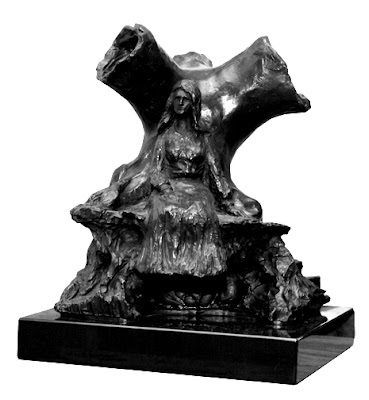 They then pour melted bronze into this porcelain mold and, after two days, break the porcelain with a hammer, exposing at last the bronze sculpture. Still incomplete, the statue requires careful cleaning, followed by a patina, applied with a torch and liquid chemicals, before polishing and shining the finished piece. Indeed, he talks about creating his recent three-sided, free-standing sculptures in this medium as well, up to now replacing the bronze with steel, aluminum, and chrome for his current public installations within the Besthoff Sculpture Garden at the New Orleans Museum of Art and on Veterans Memorial Boulevard in Metairie, Louisiana. 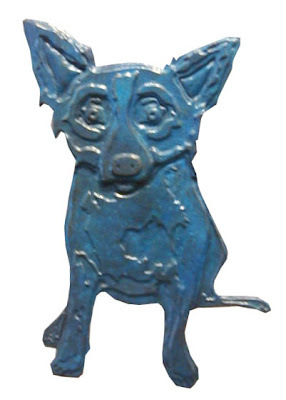 The possibility exists for a similar three-sided Blue Dog in bronze. Obviously George remains unintimidated by scale, as evidenced by his large version of Legacy in the Kaliste Saloom Office Park in Lafayette, Louisiana. 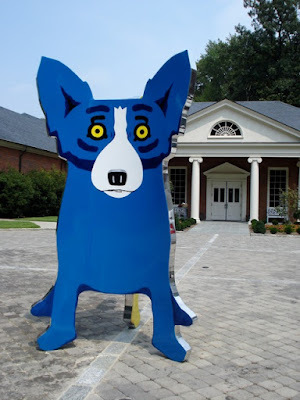 Today I’m convinced, however, that the enormous expense of working in this medium is the only thing keeping him from creating the giant Blue Dog bronze of his dreams. I see it in his eyes on our yearly visit to Rodin’s Burghers of Calais at the Hirshhorn Museum in Washington, D.C., and I heard it in his voice this week as he recounted with enthusiasm the classical lost wax process. Thinking about blogging? Beware of the side effects: Last night, like Evangeline trapped within the wax and porcelain and rubber, I found myself, with this post on my mind, trapped within the layers of a house, smothered by sheetrock, plywood, bricks and a deep screened porch. I struggled to break out, banging on the walls, my locked jaw preventing me from calling for help. At last George recognized the panicked moans through my clenched teeth. He held me as I calmed down and my face relaxed, freeing me from my dense prison, and ending the nightmare. Wendy never knew he did the Legacy. Thanks for the unique thoughts. Tell G hello. 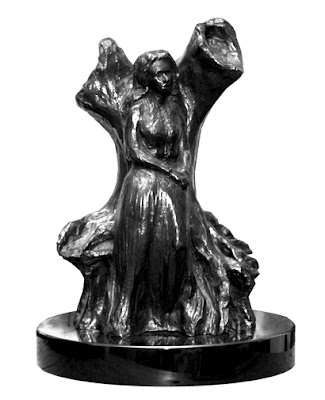 I had no idea that George also did bronze sculptures as well. Evangeline blended in the tree is a beautiful piece. The process of making the bronze pieces is identical to a process I use to cast aerospace components made of nickel and cobalt super-alloys? A hobby of mine where I start out with Computer control milling aluminum components, then makae a seperatable rubber mold the same way you described, After parting the rubber mold and injecting the cavity with wax (under pressure) we get our wax patterns. Now we use a special first coat called 'the prime' which is an extremely fine quality ceramic slurry with a little 'nucleating agent' to force fine metalurgical grains for strength. Then layers and layers of 'back coating' with coarser ceramic slurries to obtain the correct thickness. Now, wax is an expensive commodity these days, so the preferred way of removing the wax pattern is by putting the piece in a stean autoclave to rapidly melt and force out the wax. Some times we put our ceramic shell mold in a vacuum and pour molten metal ther to avoid the air from reacting with the molten metal --at temperatures up to 3000 deg F! One very important distinction in my process is that I must create parts with such precision as high as one-ten-thousandth of an inch accuracy. That artists would never want to do. Think about it, wouldn't such precision ruin the most desired part of art -- distinct and unique character caused by basic flaws in the artist's process, no? An artist learns to leverage such imperfactions as the most important quality, the character, or philosophically known as human flaw! That's the beauty of art.